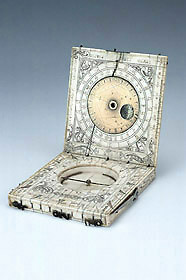 This is the oldest of the six known Flemish diptych dials. All of them have very similar characteristics, among which a folding brass nocturnal on the outer face of the upper leaf and a lunar volvelle combined with an aspectarium. The nocturnal sights bear the initials 'W' and 'D', and the extensive decoration consists of foliage and arabesques.